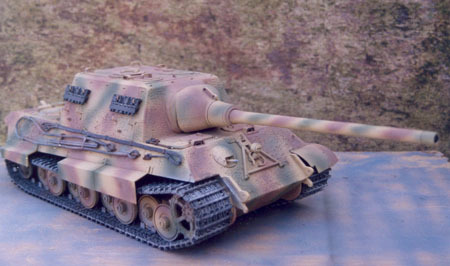 This model is based on the Tamiya King Tiger model. 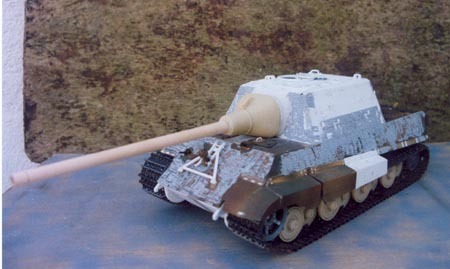 I had a second hand ready built model and was asked by someone to make him a Jagdtiger, but of course it wasn’t that easy because he wanted a Porsche wheeled version, this rendered the whole lower hull no good and a new one was made with 60th plastic card, braced inside and made to the correct length. The original top hull was then increased by the same amount and new axle openings made. A suspension arm top was made and 8 units cast in resin, as a cheating way of doing it I ran 8 axles right across the width of the lower hull and mounted the suspension arms to these. 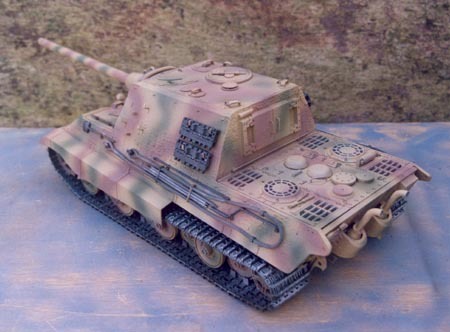 The mantlet was from a mate which he cast from resin (thanks Paul, who also did the wheels) the bulge behind the mantlet on the front of the fighting compartment was a crude shaped piece of card glued on first and then covered in Das clay allowing the mantlet to sit squarely. The barrel was from the local woodturner. I added a couple of extra links to make up for the longer chassis and used the kit sprockets and idlers, all fittings were from the original kit. Paint was sand with red-brown and green.